Much satisfaction has been expressed in Carnforth and district at the receipt of the official award of the coveted Victoria Cross to 241475 Private Albert Halton, King’s Own Royal Lancaster Regiment. He is 24 years of age, and the third son of Mr and Mrs Jonathan Halton, 19 Highfield Terrace, Carnforth. His father is one of the oldest employees of Carnforth Ironworks, and is naturally proud of his son’s achievement. He was born at Mill Head, Warton, and educated at the National School, Carnforth, under the late Mr D P Miller and Mr Strangeways, who is still on the staff. On leaving school at 13 he entered farm service, his first place being with Mr Huntington, of Brookholme Farm, Lancaster, going daily with the mill. His later situations were in the service of Mr Taylor, Arkholme; Mr Williams, Dale House, Swarthwaite; and Mrs Barnes, Thorn Top, near Kendal. He worked for a brief period on the London and North Western Railway, and was in the service of Mr Rigg, contractor, Carnforth, when he joined, in July 1915, the 5th King’s Own. He had been in France about two years. He was wounded on the Somme on 22 Oct 1916 and was treated in hospital at Aberdeen. 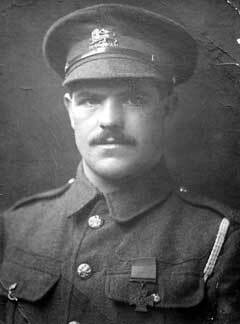 After recuperation he rejoined the King’s Own in March 1917 and on returning to the front was drafted to the 1st Battalion. At a special meeting of the Carnforth District Council on Tuesday, it was decided to open a subscription list with a view to recognising the gallantry of Private Albert Halton VC.